I've minced no bones about leopards being a nemesis species for me. They are elusive to begin with, but it does seem that when I am in the area, they get a special memo to avoid being seen. 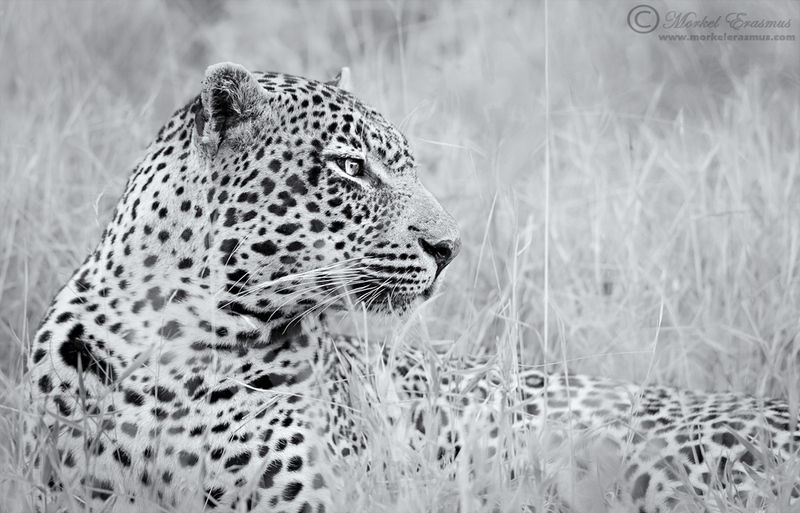 This was one such an occasion - I was visiting my friend +Marlon du Toit when he was still working at Singita Sabi Sands in the hope of building up my leopard portfolio (seeing that the Sabi Sands is infamous for its leopard sighting and density). What do you think happened? The first afternoon, upon my arrival - it started bucketing with rain. Rain which didn't stop for about 3 days, intermittently. And we saw no leopards! 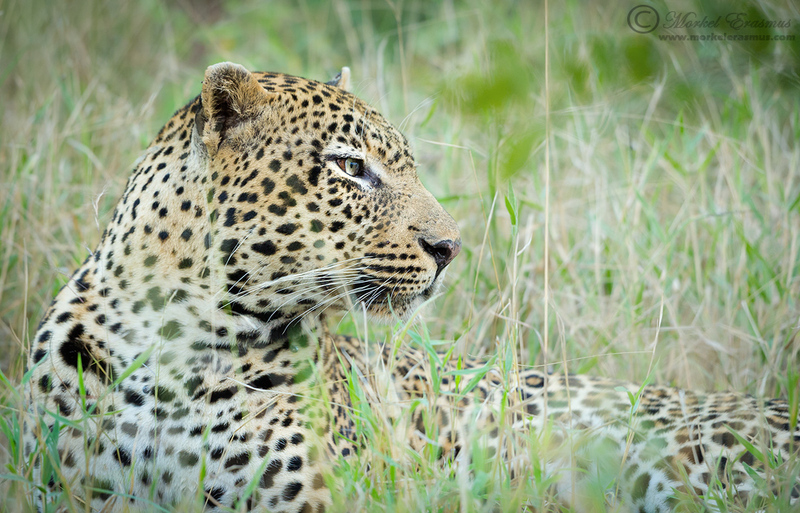 We had a couple of amazing sightings otherwise...but on my last afternoon as I was bound to leave and rejoin my family that night, we got word of a sighting of the Keshane Male, a magnificent and powerful male leopard that roams in the area. We had to fall into the queue of the paying guests, though, but eventually it was our turn. The entire sighting was spent watching his bum as he moved up the roadways in the bush, marking his territory. Eventually he settled in the grass, and for a fleeting moment (it was literally 10-15 seconds) I could snap some portraits. After this he got up and moved off into a drainage line and we had to leave so I could drive home. Anyway - this is one of the better photos I took in that brief spurt of eye contact. He has amazing eyes, but the shots where he's looking my way were all marred by blades of grass obscuring one of his eyes. This one has the eye clear, still with some pesky grass in the way. My personal processing ethic is geared more towards natural-looking photos and zero cloning out of parts of the image. One way I do deal with the grass, is through monochrome conversions - converting in such a way as to negate the effect of the grass by way of filtering out some colours. Here are 2 versions of this photo. Colour, and monochrome. Which do you prefer? And why? I prefer the color photo. What stands out to me is the eye. Even though there seems to be a highlight in the black and white that does not appear to be in the color, the color has more depth and reality - to me. It is really interesting to be able to < & > back and forth between the identical images and have the color come and go. Thanks for your thoughts, Evelyn. I too like the ability to toggle between photos on these posts. Thank you for your comment, Judy. I'm glad you enjoyed it!